Five Points Festival Lines Up Food and Beer Delicacies for Attendees! Featured along the East River in the Lower East Side is the Five Points Festival. The festival caters to a variety of niche markets from designer toys to beer enthusiasts to street art admirers. One particular feature that the convention highlights is food trucks, the often seen but rarely acknowledged hero of conventions across the country. This year, the food trucks are provided by the Live Fast Group. Parked within the boundaries of the convention, the food trucks are stationed near the standing tables and picnic tables outside, the perfect place for con goers to fill their bellies. Toum, an authentic Lebanese food truck with popular dishes like falafel, shawarma, and their delicious garlic whip! Nuchas, an empanada truck featuring unique flavors and served piping hot at $5 a pop. Mac Truck, a Mac and cheese food truck featured on the Food Network with delicious fried Mac bites that are to die for. Big D’s Grub, an Asian-inspired fusion food truck with bulgogi tacos and mouthwatering curries. Korilla BBQ, the notorious Korean BBQ food truck that’s been featured all over the country. This is a can’t miss for food truck lovers and was missing on Saturday. Of course, I can’t forget to mention the accompanying beer garden, that found a home adjacent to the food trucks. 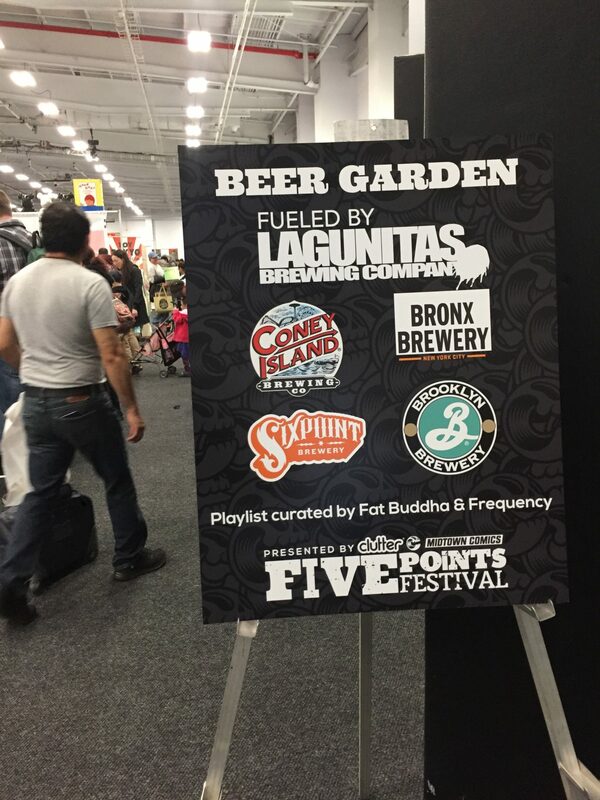 The beer garden itself is ‘fueled’ by the Chicago brewery, Lagunitas Brewing Company, but features beers from several other local breweries. With more than enough food to go around, this year’s selection features a strong lineup of local beers that is both impressive and enticing to beer lovers. And with the addition of indulgent favorites like Korean tacos and empanadas and cheesesteak, it’s hard to imagine wanting to go anywhere else to eat during the convention. Unfortunately, rain is in the forecast, so con goers should prepare ahead of time, but don’t let the weather get you down. Get yourself outside to the beer garden and the food trucks after you’re done shopping and talking shop and get yourself some food!